A) Get the kids to calm down, tell them they’re each entitled to their opinion and change the topic. B) Offer a history lesson on how Texas actually used to be part of Mexico. C) Pretend not to hear it and leave. If you’re guessed D, you were right. Knowing what to say when children bring up race and identity can be tough. And they will bring it up, now more than ever, with the presidential race and recent killings of black men by police topping the headlines. That’s why the non-profit organization Border Crossers, based in New York City, said there was growing demand across the country for its training. The group has been conducting sessions on how to talk about race since 2010 but co-executive director Benny Vasquez said demand skyrocketed in the last two years. “Schools are aching for teachers to have the opportunity to talk about it, gain an analysis and also to help facilitate conversations with students about how to effect change,” said Vasquez, a former teacher from Brooklyn. Here are three takeaways from a recent workshop for about 40 New York City teachers representing a range public, charter and private schools. 3) Know your students. Create classrooms where all kids feel safe. Children pick up clues from the world around them, and have their own biases. 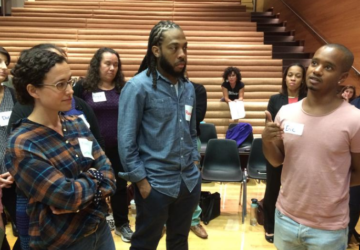 Vasquez said teachers – and kids – may feel uncomfortable talking about race but that’s part of the work. They must keep talking. While some might not consider this essential work for teachers, Vasquez likened it to a core subject. “When there’s a kid who’s struggling with math because he doesn’t understand math, know math, we work with that child,” he said. “And he might feel like I’m not adequate. And we build him up or build her up and we try to make them successful.” He said the same thing should be done about race and racism in our schools. So what is the right answer to the example above, with the two teens debating Trump’s immigration stand? No teacher wants to pick sides in a political debate. Instead, Vasquez said teachers should strive for empathy, transparency and information.